On a remote island is the Viking village of Berk. The weather isn’t exactly ideal, which makes living there quite difficult. While most communities have to deal with wolves or other predatory animals, Berk has a bigger problem: dragons. The island is frequently besieged by dragons that steal their livestock and cause massive amounts of property damage. Under the leadership of Stoick the Vast, the villagers have fared reasonably well against the dragon attacks, though they would stop at nothing to put a permanent end to their raids. The protagonist of this story is named Hiccup. He is a young man of fifteen who is seen as something of an oddball amongst the Vikings. Many of them bear scars from particularly fierce fights. Hiccup only ever hears of these stories of bravery from secondhand accounts, for he is deemed too scrawny to fight the dragons. Whenever the dragons appear, he is forced by his elders into hiding in a shelter alongside Gobber, the village blacksmith. Though Gobber was once a strong fighter, he lost an arm in combat. He now aids his comrades by forging powerful weapons instead. Not helping matters is that Hiccup is the son of Stoick the Vast – a man renowned for having slain dragons with his bare hands. Stuck in his father’s shadow, he feels he has a lot to prove. Nonetheless, he doesn’t want to sit idly by while his friends risk their lives. Therefore, he invents many mechanical devices under his apprenticeship with Gobber in the hopes of felling a dragon himself – even when they deem his enthusiasm more of a hindrance than a help. He is particularly interested in the Night Fury. Little is known about this dragon because it is few have ever seen it and lived to tell the tale. It moves with such lightning fast precision and its attacks never miss. Even the most sharp-eyed Vikings would never be able to spot it before it’s too late. During one raid, Hiccup sneaks out of hiding and uses one of his gadgets to launch bolas at what he believes to be a Night Fury. To his astonishment, he manages to strike it down, though nobody believes his accomplishment. Undeterred, he calculates where the Night Fury landed, and finds it in a secluded clearing still tangled in his net. The biggest turning point of the film occurs in this sequence. Though how it pans out is a foregone conclusion when you consider the film’s title, it’s still fascinatingly subversive of basic fantasy conventions. 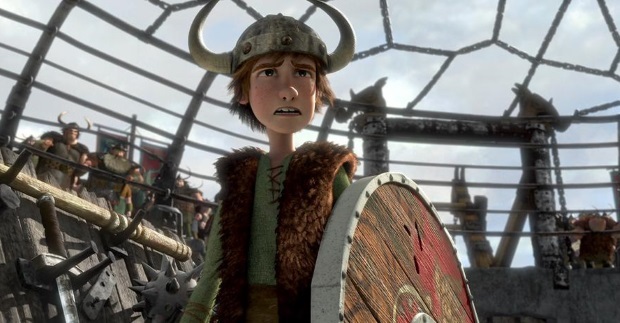 Hiccup, with his chance to prove himself to his fellow Vikings literally staring at him in the face, finds he cannot bring himself to kill the trapped dragon and chooses to free it instead. It attempts to fly away, but is unable to rise into the air due to the bolas having torn off half of its tail fin. Feeling guilty about crippling it, Hiccup designs a harness rig and prosthetic fin for the dragon, allowing it to fly with his help, and the two of them form an unlikely friendship. Noticing that the dragon has retractable teeth, he names him Toothless. What I admire about this development is that it demonstrates how much thought went into these dragons’ designs. In most stories in which the creator is tasked with designing a fantastical creature, their features either aid them in combat in some way or they exist purely for aesthetical value. This isn’t the case with How to Train Your Dragon. By inadvertently damaging Toothless’s tail fin, the dragon can’t even fly out of the clearing. Later scenes even show Hiccup sketching the dragon in an attempt to fully understand how he flies. Hiccup befriending Toothless could be considered an analogue to how humans in real life domesticated dogs. As such, I have to give the writers a lot of credit for resisting the urge to make Toothless a large, flying dog. While he does exhibit a few doglike traits such as rolling over on the ground and enjoying having his neck scratched, Hiccup also plays with him by getting him to chase a concentrated beam of light, which is typical cat behavior. Coupled with Hiccup designing the elaborate harness for Toothless, and there are clear parallels to horses as well. Because of this, Hiccup interacting with Toothless brings to mind how one would treat a pet, yet the writers refrain from drawing too heavily from any one real-life animal. The narrative does an excellent job establishing dragons as a legitimate threat, so seeing the two of them bond over the course of the film is both amusing and heartwarming. Things get especially interesting when Hiccup applies his knowledge in other situations. As this is going on, Stoick believes it’s time for Hiccup to begin his dragon slaying training and places him in a strict course with his friends and rivals. The Vikings clearly subscribe to a “sink or swim” ethos, for the curriculum involves fighting dragons they have captured over the years in an arena. Defying all expectations, Hiccup manages to pacify the dragons during training, which vastly impresses everyone in the village. He is eventually declared the winner of his class, but he now faces a moral dilemma because the final exam requires him to kill a dragon. Astrid, a stouthearted Viking girl, is highly suspicious of how he manages to defeat the dragons without raising a weapon. She quickly discovers Hiccup’s secret. Though she is understandably shocked at first, she eventually warms up to Toothless when he and Hiccup take her for a flight. At that moment, Toothless takes them to the place Stoick had been searching for this whole time: the dragons’ nest. There, they discover a gigantic dragon called the Red Death. The dragons must appease this beast with the livestock they steal from the Vikings. Whenever they fail to do so, the Red Death simply eats the smaller dragons. This is where the subversive narrative of How to Train Your Dragon is fully realized. Anyone can recite the story beats of a typical fantasy story by heart. The heroes, usually led by a knight in shining armor, must slay the dragons terrorizing the powerless citizens. It may or may not involve saving a damsel in distress. In this story, the dragons are terrorizing the Vikings under duress. At the same time, the Vikings aren’t shown to be terrible people for killing these creatures. They would have no way of knowing of the Red Death’s existence, so their conclusion that dragons are mindless monsters they must slay is perfectly reasonable. Though Astrid quickly warms up to Toothless, Stoick, having spent his entire life fighting dragons, isn’t nearly as accepting. He disowns his soon and captures Toothless so he will lead them to the nest. 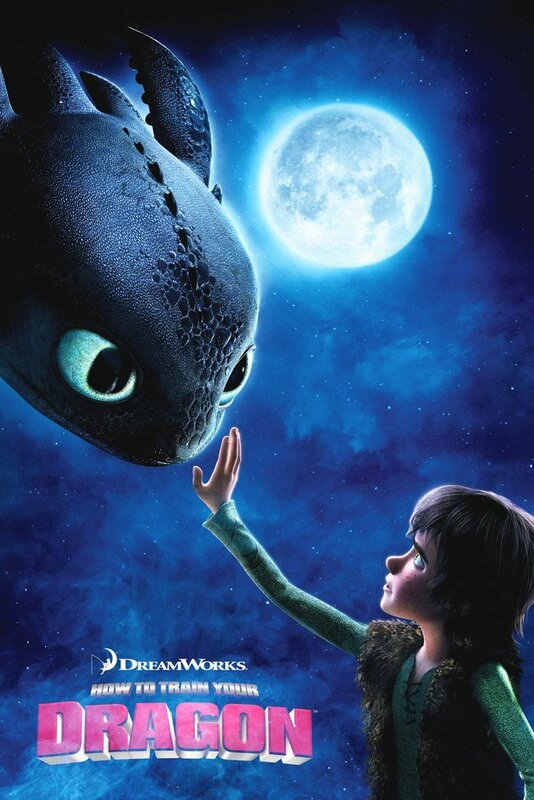 After Astrid convinces him that sparing Toothless was an act of compassion rather than weakness, he regains his confidence and sets out to save his friend. He rallies the other students and they ride the captive dragons to the nest. This culminates in a tense battle against the Red Death. Everything about this battle is excellently done. It’s suspenseful and full of great character moments. Hiccup manages to save his father from being killed from the Red Death by distracting it with one of the captive dragons. 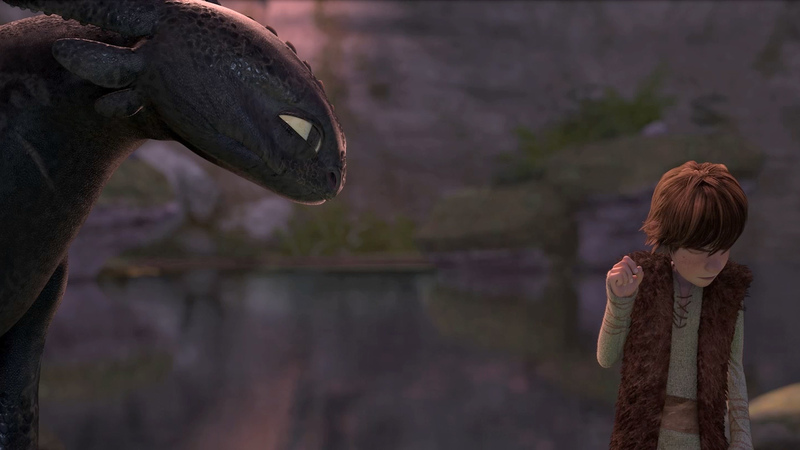 However, Toothless gets knocked into the water, prompting Stoick to save the two of them. It shows that Stoick likely wasn’t completely serious when he declared he had no son. Hiccup is grateful his father saved Toothless and he proceeds to end his coming-of-age arc on a high note by destroying the Red Death. Unfortunately, Hiccup is injured in the fight, losing his lower left leg. When he awakens, he is delighted to see that after seeing humans and dragons fighting his entire life, they now live in harmony. It is the dawn of a new age for Berk. Despite having quite a few successes such as Shrek and Kung Fu Panda, DreamWorks Animation spent a majority of the 2000s in Pixar’s shadow. There are many reasons why this is. Pixar had an impeccable track record for the entirety of the decade with Cars being seen as their only weak film – and even then, it still received decent reviews overall. DreamWorks gained a reputation for being unoriginal as a result of films such as Antz and Shark Tale, which, deservedly or not, were considered lesser versions of A Bug’s Life and Finding Nemo. What especially didn’t help their cause was that Shrek, while critically acclaimed, had a decidedly negative impact on Western animation in the long term for inadvertently encouraging other creators to promote attitude and ironic humor over sincerity. A lot of this changed in 2010, which is generally considered one of greatest years in the medium’s history following the end of the Renaissance age in the nineties. Suddenly, animators began caring about their work again. This infectious sincerity made its way to DreamWorks, and How to Train Your Dragon was the result. The film retains DreamWorks’s signature style, but there is much more focus and maturity to it. Because of this, it stands out as one of the best animated features of early 2010s, and there is a lot to like about it. The characters are great, the animation is beautiful, and the story is subversive without ever coming across as obnoxious or cynical. Whether you consider yourself an animation fan or not, How to Train Your Dragon is absolutely worth watching. Awesome! I am glad you liked it that much. And I loved your point about how Shrek had a negative impact on western animation. Indeed I did. It’s definitely one of the best Western animated features of the decade. And yeah, many animation buffs will tell you that the 2000s is the worst decade in the medium’s history (or at least a very close second to the 1970s), and Shrek is a commonly cited reason as to why that is. It’s kind of like the animation equivalent of Resident Evil 4 and its quick-time events in that it’s a good work that left a negative impact on the medium because those inspired took the exact wrong lessons from the original. Nice comparison to RE4. You are right about that. Yeah, I liked the film a lot. Cute and inventive. I generally find Pixar to be overrated and titles like this from DreamWorks really fuel my anti-Pixar campaign. Mega! It sure is. I’m not sure if anyone expected it to be this good given DreamWorks’s hit-or-miss track record leading up to it. I’ve heard at least one internet personality call it Avatar if Avatar was actually good. I would say Pixar still has the overall better track record, though in the 2010s, DreamWorks seemed to close the gap quite a lot. They still aren’t as highly regarded as Pixar, but they have proven they’re in the same league. This one has become one of their big franchises for the reasons outlined. It certainly makes a lot of sense because the world-building is excellently done.